Dance work GIMP asks "What are you lookin' at?" Heidi Latsky Dance performs this Pittsburgh premiere about disability. For many disabled individuals, more crippling than their own physical limitations are the constant reminders that they are different, as conveyed by the reactions of the non-disabled. In choreographer Heidi Latsky's GIMP, such reactions are brought into focus and turned back on the world in an effort to shed light on what it is like to live with a disability. The work's title "is a preemptive strike," says Latsky, a former principal dancer with Bill T. Jones/Arnie Zane Dance. "We're going to say the things some people are thinking before they can say it. We want people to know it is OK to feel a little strange and a bit ashamed of their responses when they see somebody with a disability." But the 75-minute work, to be presented by Pittsburgh Dance Council at the August Wilson Center on Oct. 15, goes further. "Ideally, the piece is about the beauty of difference and seeing beauty in unexpected places." The 2008 work is structured around the word "gimp" and its various meanings, from a slang term for a disabled person to a ribbon-like or braided fabric trimming and even a person with a fighting spirit or vigor. GIMP, performed by Latsky's New York-based modern-dance company Heidi Latsky Dance, began as a series of movement portraits. It became a piece about being watched and watching, Latsky says, and has evolved to include a monologue and additional layers and dialogue gleaned from audience reactions. Set to an eclectic original score by several composers, GIMP is performed by a cast of six dancers with and without disabilities, including Latsky, plus two aerialists. A prologue will include several local performers with and without disabilities in choreography developed here by Latsky this past week during a community-outreach event. GIMP's Pittsburgh premiere, and the several outreach events surrounding it, are part of the 100th-anniversary celebration of the FISA Foundation, a local organization dedicated to improving the lives of people with disabilities. 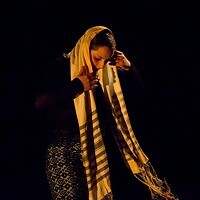 Latsky's company's stated mission -- one she believes complements FISA's efforts -- is to explore and express the human condition through movement. Creating GIMP was a window into a world she says she initially knew nothing about. Now an advocate for the disabled, she hopes the work will have a similarly enlightening effect on audiences.